Still Jazzed from the Conference? Still Jazzed! about the Agri-Marketing Conference last week? 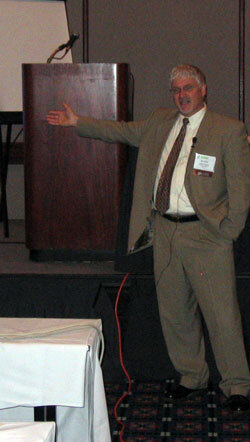 Don’t let the memories of the conference fade, check out the Conference Photo Gallery at http://www.nama.org/amc/photogallery/index.htm. Special thanks to Denny Eilers, Iowa Photo Farm, Inc., for the photo’s! Need some Best of NAMA photo’s? The Best of NAMA Photo Gallery can be found at http://www.nama.org/amc/bon/photo-index.htm. Special thanks to Kelly White, Creative Touch Photo’s, for the Best of NAMA photography! Still can’t get enough picture’s? Check out photo’s by Chuck Zimmerman, ZimmComm New Media, LLC, at http://www.flickr.com/photos/zimmcomm/sets/72057594113806082/. Because you can’t have too many photos to look at. How about another photo album? There are 76 of them. Feel free to look and download if you’d like. If you need one at higher resolution just let me know. Best of NAMA Winners were given the opportunity to have their pictures taken courtesy of photographer Kelly White (who happens to be Eldon’s daughter). A few proud winners took her up on the offer. Pictured here is Myrna Krueger with Colle+McVoy with all of the awards her agency received during the ceremony. To view all of the pictures click here. If you’d like a hi-res jpg file (suitable for printing) contact Kelly at kelly@creativetouchphotos.com (be sure to include the photo number). 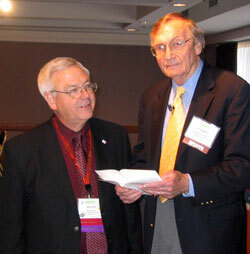 The closing brunch here at the NAMA Conference features Dr. Barrie Richardson. 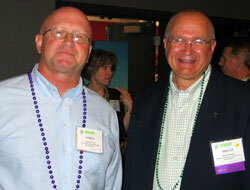 He’s pictured here (right) with meal sponsor Monte Reese, Cattlemen’s Beef Board. His presentation is on “The Plus 10% Principle – How to get extraordinary results from ordinary people.” I asked him if there are any ordinary people and how we can apply his ideas in our own lives. NAMA’s Marketer of the Year is Tom Davis, Successful Farming. I think everyone agrees that one of the biggest benefits to attending a NAMA event of any kind is the networking with peers. 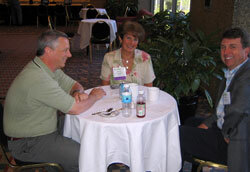 As you wander around the convention hotel you’ll see impromptu and planned meetings taking place everywhere. On the last morning of the NAMA Conference several breakout sessions were held like this one on Consumer Trends Affecting Agriculture. All the sessions were well attended just prior to the last session of the day. The World Famous Willie Arthur Smith Marching Cobras entertained us at the closing session of Connection Point. 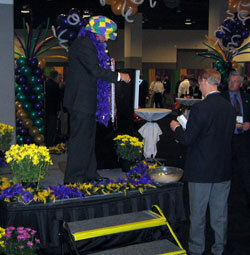 After parading around the trade show they did a little drumming and dancing. At the end of the final Connection Point session it’s time to draw winners in all the drawings going on. One that NAMA has been running as a membership incentive was a chance to win a video iPod (sponsored by yours truly). The winner was Krystil Smit who was not present. Hopefully the incentive was helpful. I think that during the time the promotion was running NAMA has had a couple hundred new members. Someone correct me if that’s not right. The twins were having a great time. Actually I don’t really think they’re twins. This is one of those, “someone put me up to it pictures.” I do think they share the same hairdresser though don’t you?